The Apple iPad captured the tablet market like no other when it was released. Even now, it continues to be one of the biggest sellers for the Cupertino based company. After facing stiff competition from Android tablets like the Google Nexus 7 and Kindle Fire HD in the smaller tablet segment, Apple finally revealed their much rumored iPad Mini. Even though it’s a new product, the internals are all from the iPad 2 to keep the costs down, although we must admit they aren’t so low. Seen as more of a response to the market than innovation, the iPad Mini doesn’t really come under the price point of its competitors but competes with Apple’s own iPad 2. So if you’re out to get a tablet around the 300-399$ range and want only Apple, read on for our comparison, iPad Mini vs iPad 2! All Apple devices have a premium feel and both the iPad Mini and iPad 2 don’t disappoint in this regard. Build quality is top notch and the devices feel solid. 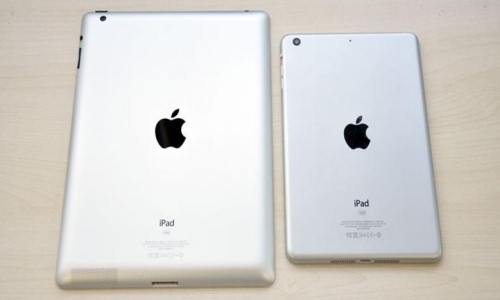 The iPad 2 is 8.8 mm thick while the iPad Mini is a tiny 7.2 mm. The main difference is in the weight. The iPad 2 weighs in at a hefty 603 gm while the iPad Mini is just 308 gm, so people who like lighter and smaller devices would probably prefer the iPad Mini. Of course, for the cellular enabled models it’s a few grams more. One of the biggest features of Apple’s new devices is the Retina Display. It basically is the name for a display that has a very high resolution even on a small screen. This results in a sharper image in which no pixels are visible to the naked eye. The final product is a crisp, clear image of outstanding clarity. Unfortunately though, Retina Display is not available on either of the devices, it was just introduced on the iPad with the new iPad with Retina Display. Both the bigger and smaller iPad use the same resolution even though the iPad 2 is a 9.7 inch screen and the iPad Mini comes with a 7.9 inch screen. Ostensibly the iPad Mini has a higher pixel per inch value of 163 ppi while the iPad 2 comes with 132 ppi. So the iPad Mini has a better resolution to screen size ratio, but if you’re a fan of bigger displays more than pixel count, the iPad 2 is for you. Like we mentioned earlier, even though the iPad 2 and iPad Mini are from different segments, the reason we’ve compared them is because of the similar price and hardware. Speaking of which, both use the same Apple A5 system on chip. It’s also the same one that the iPhone 4S uses, and the iPod Touch 5th Generation uses a 32nm version of the same as well. The dual core processor is clocked at 1 GHz, there’s 512 MB of RAM and a PowerVR SGX543MP2 GPU to keep things chugging along nicely. As far as benchmarks are concerned, the iPad Mini and iPad 2 are neck to neck. You won’t notice any differences and they perform pretty much the same. Even graphically intense games like N.O.V.A. 3 work well. Battery life is one of the two criteria in which there’s a clear winner. The iPad Mini boasts of a battery life of around 10 hours which trounces even its 7 inch Android tablet competition. The iPad 2, on the other hand, can last around 6-7 hours on a full battery. It’s a decent figure, but the iPad Mini actually has a very big advantage here. This could be attributed to the larger screen of the iPad 2. This is the second criteria in which the iPad Mini has an advantage over its older sibling. While the iPad 2 has a rear facing camera capable of capturing 720P video, for those wondering about the actual value, it’s a 0.92 MP camera. Yes, it isn’t mentioned on the Apple website either. The front facing camera is 0.3 MP and can capture VGA quality video. The iPad Mini however, comes with a 5 MP iSight rear facing and 1.3 MP front facing camera, the rear is capable of 1080P video recording and the front is capable of 720P. For the camera junkies, the iPad Mini makes a strong case here. It all boils down to the price now, you can get a new 16 GB Wi-Fi iPad 2 for 399$ and a 16 GB Wi-Fi iPad Mini for 329$. Quite honestly, the iPad Mini is expensive for its segment, but Apple fans won’t think twice before shelling out that kind of money. In India, the iPad 2 starts from Rs. 24,000 or so and the iPad Mini is available unofficially for around Rs. 26,500. Both the bigger and smaller iPad run on the same OS, have the same apps and basically all the same functions. However, the iPad Mini uses the new Lightning connector, so if you’ve got any older peripherals, prepare for expensive adapters. It all depends on what sort of a device you need. If you’re looking at the form factor, the iPad 2 offers better value for money since it’s a bigger device. But if compact devices with good cameras are your thing, the iPad Mini is for you. There’s one thing for sure, the iOS apps number in several thousands and you won’t be disappointed with the amount of content! 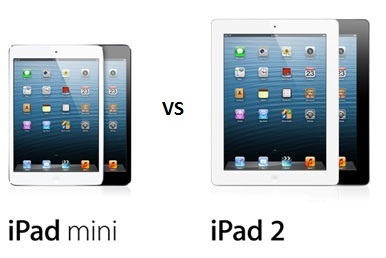 Do let us know what you thought about our iPad Mini vs iPad 2 feature, drop us a line anytime!